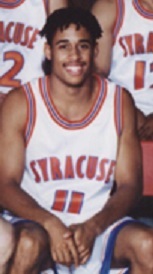 Elimu Nelson was a reserve guard for Syracuse for three seasons. He was a solid defensive player who earned playing time as a defensive substitution. He was recognized by his long dreadlocks he grew over his career; ironically, he started his Syracuse career with his head shaved. Nelson tried out for the Syracuse basketball team his sophomore year but was cut. He made the squad his junior and senior years as a walk-on. He made such an impression on coach Jim Boeheim, that Nelson played in the first half of the season opening game against Tennessee, the first time a walk-on player saw action that early in a game under Boeheim. Nelson would return to the team as a graduate student having earned a basketball scholarship, and would help provide senior leadership to a team that made it to the National Championship game, before losing to Kentucky. He would help the team by providing defensive sparks over the course of the season. Nelson would pursue acting following graduation. In 1997 he would land a guest role on the television show Pacific Blue as his first role. He would end up on several other television shows in a guest role, including NYPD Blue, JAG, The Shield, and Criminal Minds.